Drones offer precision data collection at a frequency and fidelity previously impossible to attain. As drone hardware and software continuously improve, and as the cost of use declines, the economics of scaled enterprise use is increasingly feasible. This new class of data is industry agnostic, and already creating immediate and long-term value in many industries eager for transformation. 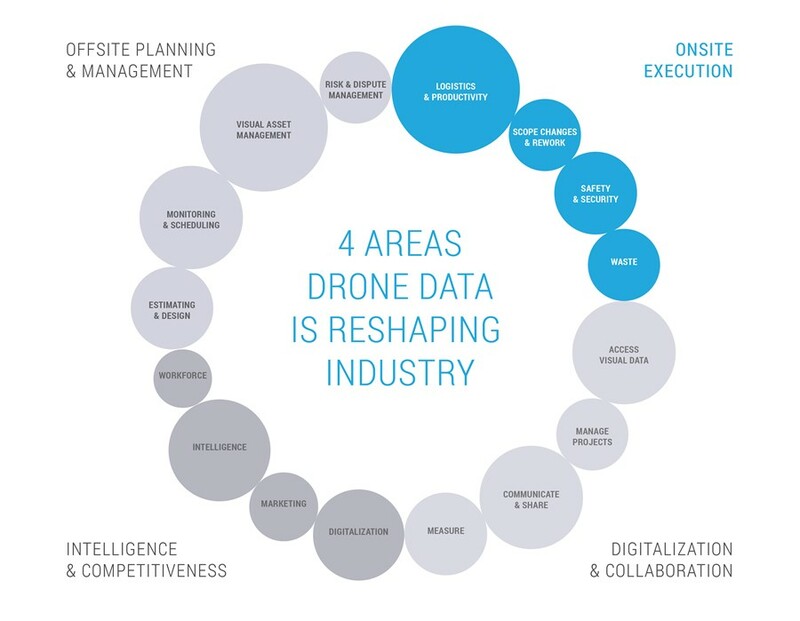 We’ve classified four primary areas, grounded in non-hypothetical applications, where 4D drone data offers immediate benefits to Industry. The most apparent area of industry set to change with the introduction of drone visual data is onsite execution. Supported by real-world examples already reinventing industry; 4D drone data is proving to enhance and boost productivity, simplify logistics and improve safety onsite — today. High frequency, high fidelity visual data provides a whole new dimension of transparency across all project stakeholders, throughout the project life cycle. Improved visibility facilitates the deployment of crew, heightens the accuracy of milestone estimates, streamlines inspections and decision-making, and more. Deploy workers, materials and equipment intelligently to optimize project work flows. Produce more accurate project progress data for timely decisions. Automate tasks otherwise performed manually. Schedule and deploy crews timely and efficiently. Monitor asset inventory and movement rates. Measure productivity down to the skilled trade level. Reduce error and return rates using drone project data. Minimize unnecessary travel with remote monitoring. One of the biggest inhibitors of onsite efficacy is scope changes and rework. Most scope changes and rework projects could have been avoided with better, more accurate visual data and widespread communication. Whether it’s the ‘right’ things done wrong, or the wrong things done right (or wrong), or simply the various things that come to light and now need to be addressed — the sooner you discover and correct issues, the less severe the change required. Improve estimating accuracy with frequent precision captured data. Inspect and monitor sites remotely with viewers capturing high resolution visual data of the space over time. Identify defects, quality compromises and scope creep with more employee’s eyes on the project data, without having to travel to various locations. Enable enhanced collaboration and communication across internal and external stakeholders and teams. A major concern shared across industry is workforce safety and project site security. Drones have the complement of agility and perspective that makes them ideal for accessing dangerous, high risk locations. They also give managers a recurrent, time-stamped, multi-perspective view of the project site that discourages theft and facilitates reporting. Identify and share hazards early with remote inspections and visual data. Monitor and review your entire portfolio of projects. Reach new perspectives previously inaccessible. Decrease personnel exposure to high risk situations. Introduce a new level of quality and quantity of real-world project data into your training and safety training programs. Collect visual data as forensic assets in the case of accidents or theft. Protect and deter job site theft and vandalism. Due to the inability to accurately estimate work and required materials, 15% to 30% of materials delivered to a job site end up in solid waste landfills. Visual data from drones provides both efficiency and effectivity gains, reducing waste and improving profitability of completed projects. Continuously monitor materials delivered to site. Provide much easier definitive bill verification. Enable cross project inventory utilization to improve project profitability. Increase accuracy of resource estimations with better data measurement. Identify and communicate insights across stakeholders. Facilitate offsite project logistics with remote estimates. 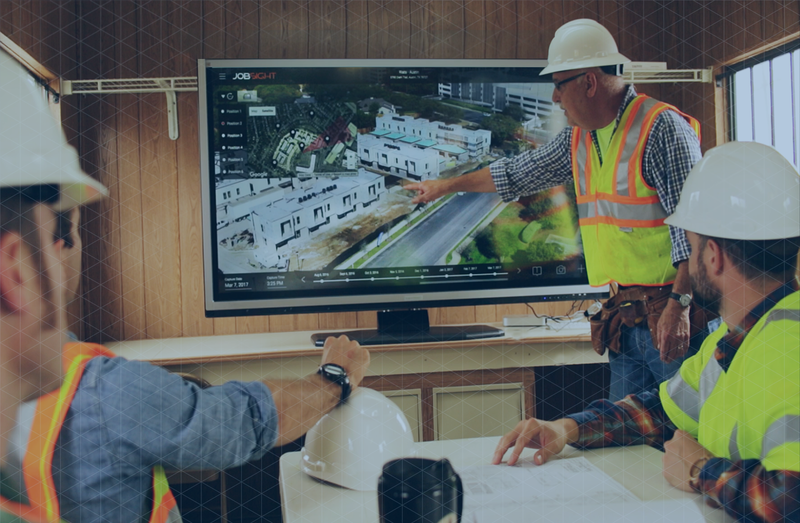 Onsite execution will see the most dramatic changes, and the biggest value-add, with the introduction of drones capturing 4D visual data on project sites. Better decisions will be made faster, mistakes will be identified sooner and made less often, workers will be deployed more intelligently, project sites will become far safer, materials requirements will be estimated and delivered with greater accuracy, and more — all stemming from better visual data.